« Trump’s next headache: ‘Unrecognized’ tax-cut benefits. One hypothesis is that, when the rubber hit the road, the furloughed employees didn’t want to give up cushy (i.e. non-essential) jobs that come with above market salaries and generous benefits, including gold standard health insurance, multi-tiered retirement (social security, 401K and a pension), and near-guaranteed life-time employment (via civil service and union contracts). 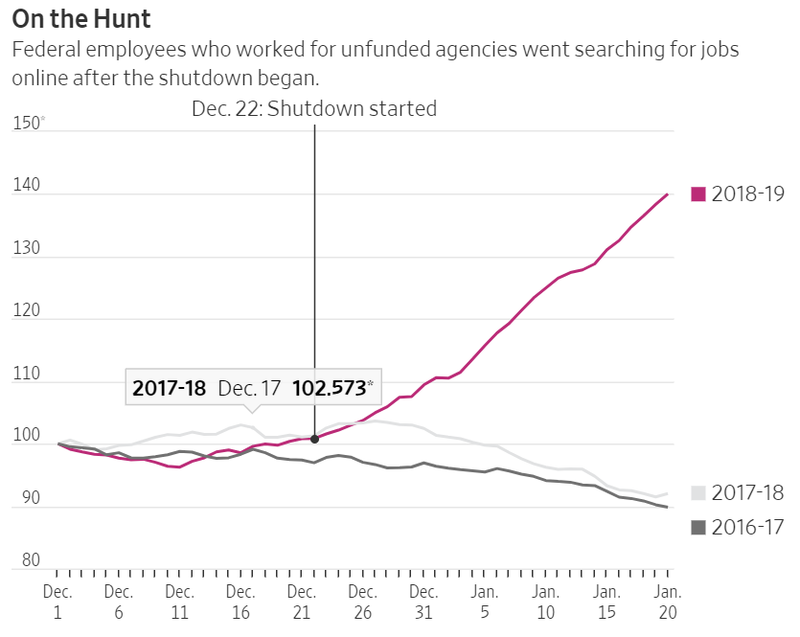 Some may have even realized that, worst case, the shutdown gave them an extra month’s vacation — albeit with with deferred pay. Another hypothesis: even in a booming economy, there isn’t much of a market for non-essential employees. That’s a province institutionalized in the government. More specifically, the job-seekers may have discovered that their skills are out-of-sync with the private sector’s needs. Maybe they should learn to code…. Learning to code was the frequent insensitive advice offered to middle America workers who lost their jobs to to government regulation (think: coal miners) or globalization (think: auto industry). As if a middle age coal miner was going to develop web sites … or auto assembly line worker was just a course or two away from a career in healthcare. Maybe non-essential government employees are better suited for those jobs … or, maybe not. This entry was posted on February 13, 2019 at 6:59 am and is filed under Government benefits, Government Employees, Government shutdown. You can follow any responses to this entry through the RSS 2.0 feed. You can leave a response, or trackback from your own site.